DRYDEN – The Northwestern Ontario Municipal Association is speaking out against a section of Bill 68: The Open for Business Act, 2010 that could further hurt the forest industry in Ontario. Bill 68 proposes to change the rigorous Crown Forest Sustainability Act to give the Endangered Species Act (ESA) higher authority when there is a conflict between an ESA agreement, permit or instrument and a previously approved Forest Management Plan. 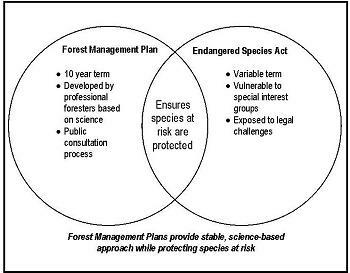 Implementation of Bill 68 would still require forest companies to undergo two duplicative processes but the legislation puts top billing with the ESA process– a process that was not developed by professional foresters, that would expose the industry to on-going and expensive legal challenges from special interests groups, and that reduces the efficiency and stability of the forest industry in Ontario. In a written submission to the Standing Committee on Finance and Economic Affairs in their review of Bill 68, NOMA has recommended that the committee remove the section of the Bill regarding changes to the Crown Forest Sustainability Act. NOMA has also proposed that the Endangered Species Act, 2007 be amended to make the Forest Management Plan the all-inclusive process for forestry companies. The full submission is available at www.noma.on.ca In addition, NOMA is continuing its letter writing campaign on this issue. NOMA represents the interests of municipalities from the City of Kenora in the west to the Township of Wawa in the east. It provides leadership in advocating regional interests to all orders of government and other organizations.